It’s one of the primary missions of law enforcement to eliminate tragedies and protect people. As part of our strategy, law enforcement and community partners in Sarpy County have created a Sarpy County DUI Task Force, made up of the Bellevue Police Department, La Vista Police Department, Papillion Police Department and the Sarpy County Sheriff’s Department, along with MADD and Project Extra Mile. Part of the inspiration for a county-wide task force comes from a letter received from the mother of a DUI victim, Christine Chrisman of Norfolk. Her son Paul White and his friend, Dan Mueller were killed by a drunk driver in 2007 (A copy of the letter is attached). We have countless other tragic incidents that have haunted us here in the metro and Sarpy County. Who can forget the tragic death of Dr. Adam Smith in 2012 at 118th/Harrison, killed by a drunk driver almost 4 times the legal limit at 8 o’clock in the morning. We’ve worked with our law enforcement partners, prosecutors, Nebraska Office of Highway Safety and community advocates to create this task force. We will increase the targeted enforcement of DUI through sustained enforcement by limiting the impact on each cooperating agency’s resources. 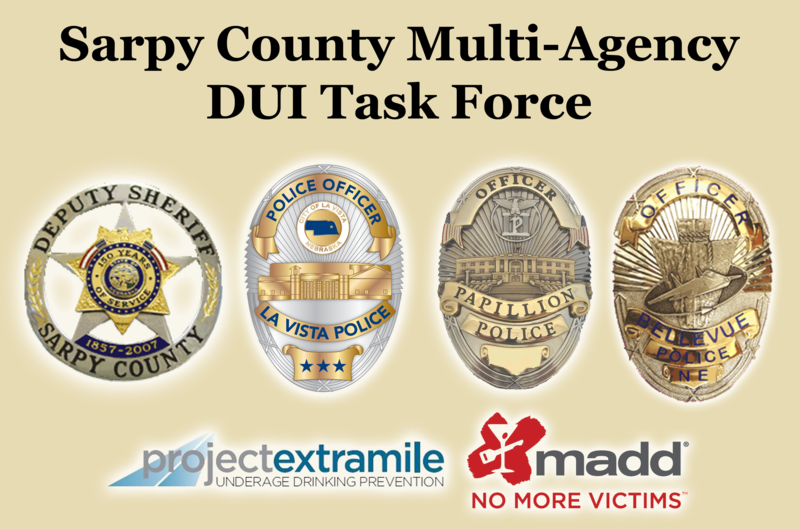 The formation of the Sarpy County Multi Agency DUI Task Force IS a confederation of law enforcement agencies working collaboratively to create omnipresence for law enforcement in Sarpy County. We will be increasing their number of patrols, setting up DUI Checkpoints, making high volume traffic stops, multi-agency saturation patrols, and using local and social media to reach all drivers. If you’re drinking and driving, the Sarpy County Multi Agency DUI Task Force will be out to find and arrest you – no warnings, no excuses. You will face jail time, fines, loss of your driver’s license, towing fees, and other DUI expenses, totaling $10,000 on average. Not to mention the humiliation among your family, friends, and workplace. The only way to truly avoid a DUI is to drive sober. There are many ways to get home safely after drinking, and driving isn’t one of them. Designate a sober driver ahead of time, or call a friend or family member. You could also use public transportation or call a taxi. The cost of cab fare is nothing compared to a $10,000 DUI or the cost of someone’s life, and the ‘inconvenience’ of not driving your own car home is nothing compared to the inconvenience of spending time behind bars. In addition to reminding all drivers to drive sober, local law enforcement is calling on everyone to be alert. If you see a drunk driver on the road, Report Drunk Drivers – Call 911! — you could save a life. If someone you know is about to drive after drinking, take their keys and help them get home safely. • Under the right conditions, even one drink can impair your judgment and increase the risk of getting arrested for driving drunk—or worse, the risk of having a crash. • If you will be drinking, do not plan on driving. Plan ahead; designate a sober driver before the party begins. • If you have been drinking, do not drive. Call a taxi, phone a sober friend or family member or use public transportation. The Sarpy County Sheriff’s Department created the "I Care Cab Fare" Program to discourage impaired drivers from using their automobile and instead use a taxi service. The cards are essentially a credit card that can be used in any Omaha Metro area cab. Anyone interested in the program can purchase an "I Care Cab Fare" card over the counter at any SAC Federal Credit Union locations in the area. In 2014, Nebraska saw 1721 DUI crashes, with 78 people killed and 1128 injured. Sarpy County itself had 1988 total crashes, 103 involved alcohol, with 3 killed and 1281injured. 1 person was killed and 60 injured by DUI drivers in Sarpy County last year.